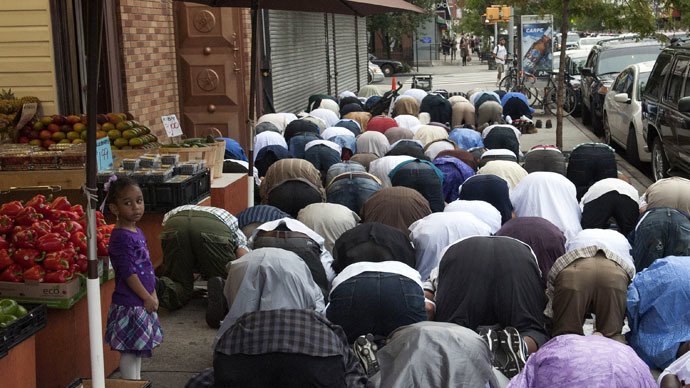 Muslims in New Jersey are set to go to court over the ruling that New York City police are legally allowed to carry out surveillance of their activities. The case is spearheaded by two civil rights groups: Muslim Advocates and the Center for Constitutional Rights, and involves the NYPD monitoring the Muslim residents at businesses, mosques, restaurants, schools and universities since 2002. "The city's surveillance program is explicitly based upon, and accordingly perpetuates, a malignant stereotype: that Muslims are a danger to society," lawyers for the civil rights groups wrote in their appeal brief. They added that their clients’ reputations were harmed, and livelihoods threatened, by the NYPD’s move. Among the plaintiffs are a US soldier, a school principal and students of Rutgers University, AP reported. Lead plaintiff is Syed Farhaj Hassan, an Iraq war veteran and a military intelligence specialist. In December, he told NorthJersey.com that he feared being associated with a mosque under surveillance, as it might tarnish his record and jeopardize his job. The school principal told the same media outlet that she thought her career prospects had been hurt because of her association with two girls’ schools that were under surveillance. The Council of Imams in New Jersey, also a party to the lawsuit, claimed that the mosques’ attendance and financial support had been sharply reduced after visitors found out about the surveillance. The NYPD’s activities were disclosed by an AP investigation that received a Pulitzer Prize in 2012. The articles revealed that police officers had allegedly mapped Muslim neighborhoods and businesses, scanned license plates outside mosques, and spied on student activity online. In response to the articles, US District Judge William Martini stated that security forces couldn’t carry out surveillance on “Muslim terrorist activities without monitoring the Muslim community itself." He added that AP, and not police, would be responsible if any harm was caused. New York City stated that New Jersey authorities found no evidence that the city police department had broken any state laws.